Enjoy a fantastic day out with Captain Tama's crew on Rarotonga's Muri Lagoon where you can snorkel with a myriad of colourful reef fish. Visit a marine reserve for a snorkel before heading to a small island (Motu) in the lagoon to enjoy a fresh fish open fire BBQ "island style". It's the thing to do in Rarotonga! 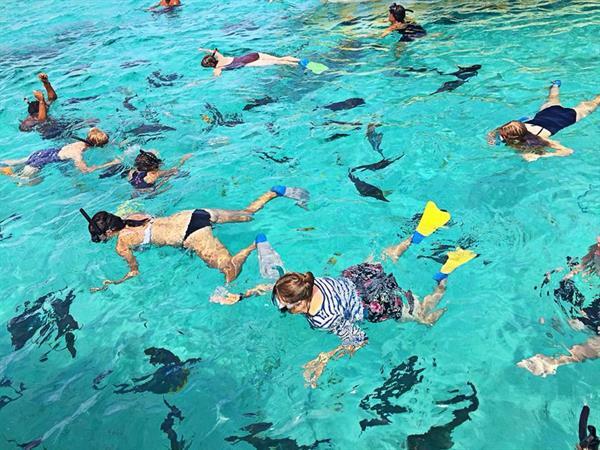 Cruise on our glass bottom boats to the marine reserve for some awesome snorkelling with giant clams and schools of colourful fish, feed the fish before heading to Motu Koromiri for a Raro Style fres fish BBQ. To top of this magic day, you’ll be treated to a pareu (sarong) tying and coconut husking show that are guaranteed to have you in stitches. Award Winning Duo, Highland Paradise & Captain Tama’s have joined forces to bring you a fantastic cultural experience. The Highland Paradise is an authentic cultural feast of Cook Islands entertainment at its best. Captain Tama’s is so much more than just a snorkelling and BBQ lunch tour. Cancellations on the day will result in a 25% cancellation fee. If you do not show up on the day a 100% cancellation fee will apply. If your booking is cancelled due to weather conditions that do not allow Captain Tama's to operate, an opportunity to rebook or a full refund will be offered. IMPORTANT: Please note that once a booking is confirmed, tickets are non-refundable unless 1. Cancellation is made not less than 24 hours prior to the boat's departure time. 2. Cruise is cancelled due to unfavourable weather or sea conditions.